A full moon appears beyond Manners Wood and starts to ascend in an arc that will shed silver light into my room. I know that this full moon, just like every other, will disturb my sleep pattern and bring strange dreams. Arriving at the same time comes another harbinger for a late night. The Black Tar Prophesies Vol. 4 , 5 & 6, the latest release from Grails. 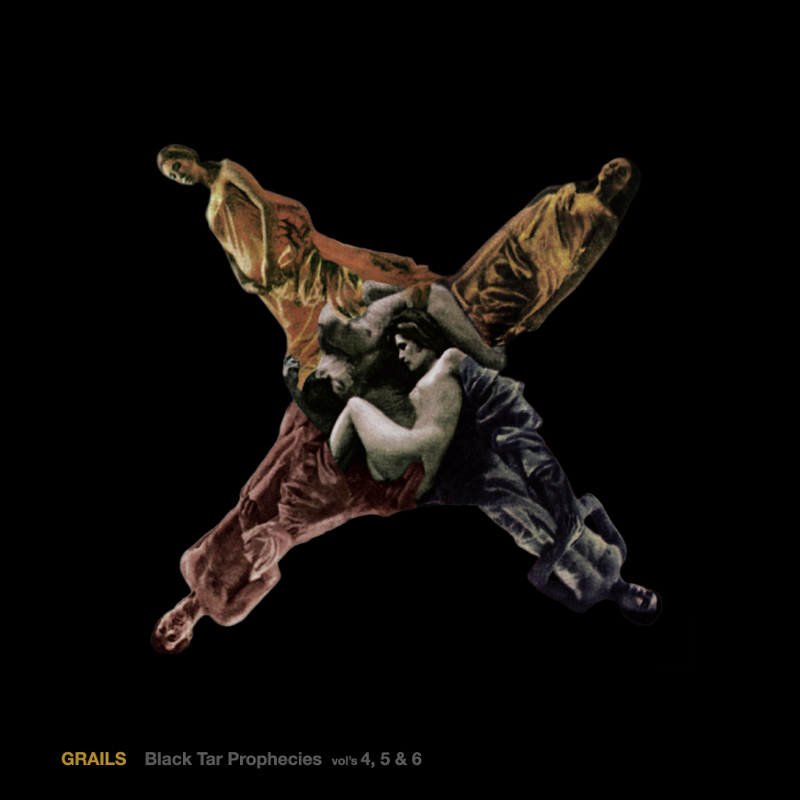 Any new tunes from Grails is an event not to be missed, but the release of these mysterious and rare recording cause the old heart to miss a beat. I guess the very title alone gives a clue as to what the new listener might expect but as I settle down, logs on the fire, lights low and favourite tipple in hand, I was not expecting the opening verses of an old Gospel Redemption Song to swell from my speakers like a rising tide of hope. Grails do not fit into the category of Post Rock easily and these instrumental offerings slice through the genre with a surgeon’s precision. ‘I want a new drug’ slides into a massive ‘Self – Hypnosis’ driven by a tasty guitar lick. It is gorgeous. The Black Tar Prophecies develop into a strangely warped journey through a Morricone-inspired territory producing what could be a soundtrack for an unmade horror movie or the companion to the times we live in. Half way through the album, a preacher’s voice shocks me from my comfort zone. “Be Ready”, he warns in a voice overflowing with redemptive fervour on ‘New Drug 2’. Vol. 4, 5, & 6 have a more reflective feel than is usual but those sinister undertones are always smouldering just under the surface. And, yes, my dreams were odd. Posted in Apocalyptic stuff, rant, reviewsTagged Black Tar Prophecies Vol. 4 5 6, GrailsBookmark the permalink.